The val Cordevole: a Gateway Into the Dolomiti Bellunesi. 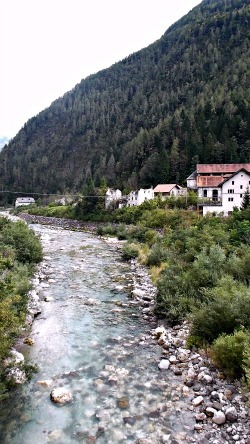 The Val Cordevole is the main valley that descends from the region of Agordo, north of the provincial capital of Belluno. If you decide to head in that direction, you will soon start climbing the slopes of steep mountains which are the ante-chamber of the wilder Dolomiti Bellunesi to the north. The valley is crossed in all of its length by the Cordevole stream (pictured above), which is the major tributary of the Piave. Some sections are in fact already under the protection of the Dolomiti Bellunesi National Park, which has equipped two thematic trails at the foothills of this steep curtain of mountains – namely, the solitary and romantic “Sentiero delle Chiesette Abbandonate” (the “Trail of the Abandoned Churches”) and the equally appealing “Via degli Ospizi” (the “Way of the Inns/Hospices”; both trails described are in more detail below). The first trail is centered on the many chapels and little churches that were built on these little-inhabited slopes since time immemorial, sometimes in locations that had already been places of Pagan worship long before becoming Christian. The saints to which the chapels and churches are dedicated – San Liberale, San Gottardo, San Michele, San Martino, San Floriano and so forth – bear witness to that continuity of use, as often these were warrior saints, highlighting also a connection with the not-too-distant Germanic world. Following on that note, the second trail is inspired by the idea of the pilgrim's route that in ancient times used to connect Germany and Northern Europe to Rome through the corridor of the Val Cordevole. For that reason, a number of monasteries and hospices sprung up along the way – the most notable of which is certainly the Certosa di Vedàna (Vedana Charterhouse, also described below). Documented since the 12th century, this latter religious compound was rebuilt in the 17th century as a Charterhouse that is still inhabited today by an enclosed order of nuns, and for that reason it is unfortunately barred to the general public. The building still remains an amazing sight, however, unmistakable as it is with its pale-yellow coloured walls, and impressively located at the foothills of the Dolomiti Bellunesi just before entering the narrow, impressive gorges of the Val Cordevole (known in this section as Canale d' Agordo, to the east) and the Valle del Mis (to the west). Further on from here, paths will take you into wilder and relatively uncharted territory. A popular outing from Belluno is to Monte Schiara (2,565 m) and the Rifugio VII Alpini. Geographically – as well as visually – Mt. Schiara is probably the closest mountain to Belluno. Roads lead up to Bolzano Bellunese or the Col di Roanza, from where one has to continue on foot on trails that will soon enter open meadows, affording wider and wider views over the city and the Val Belluna beyond. The only setback is that, being relatively close to town and because of the modest altitude (1,502 m), the area around Rifugio VII Alpini can easily become a crowded playground – especially so in busy summer weekends. But keep walking past the mountain hut, and you will soon find yourself following the "Alta Via" ('Alpine Highway') No. 1 – the so-called 'classica'. This will take you close to the top of Schiara itself, and near the curious geological feature of the Gusela del Vescovà, just beside it – a rock folly in the shape of a needle. It has to be reminded that after a certain point specialized equipment will be required in order to continue. On a more gentle note, it is also worth remembering that the area around Monte Serva (2,132 m) – an outlying summit of the Schiara group – is a lot easier to reach, and has long been renowned as a plantsman's paradise: pretty much the Belluno counterpart of the more famous Vette Feltrine to the east, an excursion here at the height of summer can be highly rewarding – especially if the beautiful Alpine flora is what you're after. The area covered in this brief itinerary includes the northern strip of the Masiere di Vedana (heaps of erratic boulders and debris), seen in the National Park, and several farming areas South-east of the hamlet of San Gottardo. The trail overlaps in part with two of the Park's thematic trails: the ‘via degli Ospizi’ (see below), which begins at the Vedana Charterhouse and heads north into the Val Cordevole, and the 'Trail of the Abandoned Churches', a long-distance itinerary that goes from west to east, crossing over the Cordevole stream via a footbridge. The historical importance of these itineraries is testified by the Vedana Charterhouse, and the ancient inn dating back to Medieval times in the hamlet of San Gottardo. These aspects are examined in the boards dedicated to the ‘via degli Ospizi’ (the "Route of the Inns"), while the charting of this brief circuit "at the Park's Gateway" focuses more upon some of the specific elements of lansdcape and nature. The stream, the riparian woods, the farmlands, and the 'masiere' are the backdrop to an easy trail suitable for everyone, which can be completed in under an hour. Lastly, the trail would not be complete if we didn't mention the ancient mythical city of Cornia, which, according to legend, was supposed to have risen on the right bank of the Cordevole stream, where the evocative and enigmatic microcosm of the 'Masiere' di Vedana now stands. 1. The "Country of the Little Owls"
Traditional rural areas like the one we find here are made up of a rich mosaic of environments in which there is an alternation of cultivated fields, bushes, woods, orchards and meadows. This type of countryside is the one preferred by small nocturnal birds of prey, such as the little owl (Athene noctua). The little owl is carnivorous, and feeds upon small vertebrates and large insects. Like any other nocturnal bird of prey, it swallows the prey whole, to then regurgitate it in small pellets -- the mass of undigested parts (fur, feathers, teeth, bone, and the exoskeleton of insects). Popular tradition unjustly considers the little owl as an omen of bad luck, but in ancient Greece this bird was considered sacred to the Wisdom Goddess, Athena, which is the origin of the little owl's scientific name. The presence of other owls has been reported in this area: the Eagle Owl (Bubo bubo) and the Long-Eared Owl (Asio otus) use the rocky areas and woods of the Val Cordevole to build their nests, and the nearby countryside for hunting. They are the largest nocturnal birds of prey; the Eagle Owl is as large as an eagle, and has no trouble in hunting animals as big as a hare. The presence of these fascinating animals make the areas "at the Park's Gateway" very important for the overal biodiversity of the National Park. The origins of the Masiere are surrounded by legend as is often the case with the mysterious phenomena of nature. It is said that a wealthy city called Cornia once stood here and was inhabited by cold-hearted people who denied charity to the poor. Jesus Christ and St. Peters, dressed as paupers, are said to have come here one day, and were given nothing. The only person to welcome them was a poor widow, who was rewarded for her kindness: Jesus performed a miracle by transforming bricks into food for her and her starving children, and then said to the widow: "if you hear a loud noise during trhe night, do not get out of bed and do not look out of the window". The Lord went to the mountain, knocked on the rock, and made it collapse onto the ungrateful city. The woman was frightened and went up to look out of the window: she was hit by a splinter, and was blinded. The Lord, however, had mercy on her, touched her eyes, and she was healed. Every other house was buried by the landslide, except for the tiny house of that poor woman. In the days that followed, everyone started to dig, searching for buried treasures, but nobody succeeded. A man found a beautiful church -- with the candles still burning --, but while he was digging through the ruins, he was killed when the passage closed behind him, and crumbled above him. The city of Cornia was wealhty, but, as we can see, it was also so greedy that it could not escape God's punishment: this is how the legend goes. The Cordevole runs for 79 kilometres. It is the most important stream in the Dolomites, and the main tributary of the Piave river. It crosses the entire Agordino region from the Passo Pordoi (about 2,200 metres, where the source is located) to the Vallone Bellunese (Valbelluna), south of Sedico, at an altitude of 275 metres. Like all streams in the Eastern Alps, its capacity is extremely variable, and a very large amount of sand, gravel and pebbles flows with it. Observing the Cordevole allows everyone to notice the extreme variety that it hosts: the fingers of both hands wouldn't suffice to count the different types of rocks that make up the stream's riverbed. The stream flows through the entire Agordino territory, carrying the different types of rock that typify the areas it crosses. You will find metamorphic rocks, rocks of a volcanic origin mixed in with calcareous rocks, and those native to the Dolomites in all of their variations. Stones are of all colours: the most ancient are the black-iridiscent schists; then there are red-purplish porphyry; dark, volcanic rocks; red sandstone, as well as green-blue, brown and very white crystalline Dolostone -- it is quite a collection, indeed! There is no lack of surprise, either, and rarities such as dark fragments with irregular contours and visible bubbles appear: these are lava residues that are scattered throughout the stream's gravelly bed; remains of the metallurgic activity that took place for centuries in the mines of Valle Imperina, about 20 km from here. The Cordevole valley represents a ‘canale’ – a narrow corridor, deeply cut in the rocks and connecting the Dolomites to the Pre-Alpine sector – that is, the Agordo region to the Belluno region. It is a very old transversal valley that crosses the entire chain of the Dolomiti Bellunesi (the picture above is taken along the val Cordevole in the vicinity of the disused mines of Val Imperina, described in more detail below). As it often happens with ancient valleys, this is a complex environmental system, to whose morphologic evolution have contributed several factors: valley glaciers, old water courses, degradation of the side slopes (landslides and erosion) and, locally, karstic corrosion too. Glacial molding, mainly due to the action of an inserted branch of the ancient Cordevole glacier during the glaciations, is responsible for the vaguely ‘U-shaped’ valley’s transversal profile (detectable by the relatively ample valley floor with steep, and often craggy, side slopes). Particularly atmospheric is the section between La Stanga and Castei, which takes the aspect of a deeply cut gorge incised in the sub-horizontal rock layers of Main Dolomite (it is therefore a karstic canyon). The main valley is flanked by a system of deep and narrow side valleys and gorges, some of which are clearly structured along old important fault lines (the Val di Piero, Val Vescovà and Val Pegolera, amongst others). e) the disused mines of Valle Imperina (read below). The anthropic aspect is connected with detritus deposits derived from the excavation of galleries for hydro-electric purposes. There is also a fault line in the Main Dolomite rock, visible from the right flank of the Castei valley. “La Pissa del Castei” is a singular waterfall that dried up during digging work for the Castei road gallery; to remember it, there still is a cone-shaped deposit in travertine. Just above Castei, there is also a Dolomite tower known as ‘La Panocia’ (the cob). “An indefinable beauty that can only be expressed by an oxymoron – a jumble of two words which are only apparently irreconcilable: horrid beauty”: these words were written by Antonio Stoppani in Il Bel Paese, in 1876. The Val Cordevole is a narrow and deep valley, like a channel (‘canale’) connecting the Belluno area with the Agordo region. It is a very ancient transversal axis that crosses the whole chain of the Dolomiti Bellunesi. It is also a complex environmental system, whose morphological evolution depended on glaciers, watercourses, landslides, erosion and – locally – Karst corrosion. The action carried out by the ancient Val Cordevole glacier during the glaciations can be recognised by the slightly U-shaped silhouette of the valley (rather large valley floor and relatively steep slopes). The shores and gravelly bed of the Cordevole are distinguished for the rich variety of rocks that can be seen there: light-coloured (limestone, Dolomite); dark-volcanic (porphyry, andesite, volcanic sandstone); multi-coloured (conglomerate, gneiss) and foliated silver-grey (phyllites). Of particular charm is the section of valley between La Stanga and Castei, which takes the shape of a deep gorge dug into the stratified banks of Main Dolomite – a veritable Karst canyon. The main valley is flanked by a system of narrow, deep side valleys and gorges, some of which are clearly situated along important fault lines (Val di Piero, val Vescovà, val Pegolera). With short detours from the main road, it is possible to enter and explore very charming and interesting micro-environments such as the waterfall in the Val di Piero – a high leap situated in a canyon –; the gorge at the entrance of the Val Pegolera, and the giant kettles located at its bottom: ‘pools’ dug on the rock strata of Main Dolomite by the vortical movements of water and the detritus transported during flood events. These are unique environments, where yew trees (Taxus baccata) and the beautiful Golden Lily (Hemerocallis lilio-asphodelus) – which prefer shady and humid places – live. The rocky banks of the Val Cordevole also host the Eagle Owl’s (Bubo bubo) nest – the largest nocturnal bird of prey. With the passage of time, California had become a small touristic center, with interest focussing on a hotel which at that time was famous in the whole province of Belluno: scheduled buses ended their journey here; a beautiful road allowed an easy connection towards Tiser and, although not as easy, a connection towards the Mis valley, and consequently the Valbelluna, too. New houses had been built thanks to the lifeblood of tourism, but unfortunately that November of 1966 stopped all projects concerned with the development and maintenance of the poulation of the upper Mis Valley. From a research written at the time (W. Brugner, G. Cargnel & A. Valladinucci, "I dissesti caustai dall'alluvione del 1966 nella Provincia di Belluno") and published in the National Geological Service Bulletin, one can extract interesting comments and explanations concerning the alluvial floods, which in this valley seemed to have reached their maximum devastation: "(...) In the territory of Gosaldo the slopes were destroyed by landslides, the small valley cuttings were eroded on their sides, and at the bottom the roads were badly disarranged; the majority of the dwellings suffered damage, many were destroyed or partially demoilished; the torrents Mis and Molini (or Gosalda) became flooded over; the main town (Don) and the hamlet of California were overrun by heaps of debris and piles of rocks dragged along by the water in full flow (...)", and it goes on: "(...) the rain on November 4th and 5th, and the subsequent exceptional floods, transformed the valley into a horrid gorge, with the valley sides devastated by landslides, and the bottom littered with heaps of mixed rocks and fragments, which in places raised the the banks of the torrent by a number of metres (...)"... . Again, from the narrative: "(...) the enormous mass of material swept along by the water overran and partly destroyed many of the buildings in the village, almost all of them recently built or restored; the few that remained, which were more or less seriously damaged, were left half-buried in the alluvial deposit. These, as a matter of fact, raised the bed of the Mis and the Gosalda (the latter in the final section) by several metres, transforming the green valley bottom into a white flat mass of rocks, among which the waters of the torrent meandered (...)". Now, little remains of all this devastation, but a general neglect of all the valley, as the Mis valley underwent a considerable transformation, which caused the collapse of whole parts of its territory, both from the morphological, as well as the social and economic, point of view. However, with the institution of the National Park, the Valle del Mis has come to a new life, but the "ghost town" of California remains a tragic reminder of those events. The nearby settlement of Pattine (686 m above sea level) came into being as a result of the mining activities in the area, which were not limited to the one in the Vallalta (mercury), but presumably to the more ancient metallurgical mining activities also, like the one at Pian delle Loppe (siderite, argentiferous copper). The name 'Loppe' seems to derive from the Latin luppa, "melting slag". The importance of this place is demonstrated by the presence of rather large buildings, one of which was documented in 1790 as the Palazzo della Miniera (the "Mine's Building). The settlement structure of Pattine takes advantage of a rather gentle slope, in comparison to the surrounding area: the buildings seem to be facing different directions, but mainly westward. The front façade of most of the houses is perpendicular to the rooftops. Inevitably, the isolation of the village and the lack of economic activities in the past have caused it to empty. There is an interesting fresco painting on one of the buildings, here: its value is found in its symbolic representastion of saints, and the beauty of the figures depicted. To the right of the house with the fresco painting, there is a detour to be taken: you can proceed for a few more meters along the mule track to the hamlet of Mori. Next to the last home near the fountain, there are two interesting cast iron semi-spheres that serve as small water reservoirs: these two elements were once used in the furnaces at Vallalta to gather the mercury that came from the distillation of cinnabar. There is a lovely mountain view, from here, on the Croda Granda mountain range, overlooking the villages scattered along the opposite slope of the Valle del Mis: Zavat, Bezzoi, Carrera and Scoli. The peacefuleness and isolation of these places make them an ideal area for wildlife to seek shelter. This is proven by the spontaneous, albeit sporadic, return of lynx, bear and wolf. These species once roamed the entire Alpine region, but had slowly disappeared during the 19th and 20th centuries due to the presence of man. In 2012, the wolf named Slavc stopped here for several days before continuing his long journey from Slovenia to Lessinia, but for the past twenty years there's been evidence of bears and lynx coming from the east first (Slovenia), and then from the west also (Trentino). The presence of large carnivores enriches the biodiversity of this protected area and bears witness yet again to how this area of the Dolomites is an important corridor used by wildlife to get to and from the Alps and the Balkans. As you leave here, follow the marked trails that will take you to descend to the bed of the Pezzea stream: here you will also see the ruins of some buildings used by the miners at Vallalta, whose mines are described below. In nature, Mercury (Hg) can be found in its pure form or combined with silver; however, it is usually found in the mineral cinnabar (mercuric sulphide), which is a form of sulphur. Mercury is extracted from cinnabar through firing. At 580° C, cinnabar sublimates, and sulphur separates from mercury; one changes directly into gas, whilst the other into droplets of condensed metal. This procedure is carried out inside furnaces called shaft kilns, constructed for this specific job. One can still see the ruins here; they represent the Austrian remains of two distillation furnaces, the condensers and washing plants, dating to 1905. The first records of exploration and utlisation of the Vallata mining area date from the first decades of the 18th century, when after a series of fruitful tests along the bed of the Pezzea stream, in the valley of the Moneghe, in 1740 the Republic of Venice granted N. H. Pisani permission to exploit the mines. The mine was very rich, but the high cost of transportation of the minerals, which were not concentrated in situ, but carried to Venice by mule, brought about the almost immediate closure of the mine, which was subsequently reopened in 1770. Nani and Pisani, two Venetian aristocrats, resumed the activity -- again in the in the higher part of the mine -- along the course of the Pezzea stream, but for the same reasons that caused the first closure of the mine, mining ceased until the beginning of the 1800s. Until halfway through the 1800s, there were various half-hearted attempts to exploit again the mineral ore, up to 1852, when the mine passed into the hands of the Società Veneta Montanistica. The new workings had an industrial set up, and at the same time, kilns were built in proximity to the confluence of the Pezzea and Mis streams, allowing for the full explotation of the mineral deposits. Whilst subterranean exploitation progressed deeper, followed by tunnels carrying the material to the surface, during the second half of the 19th century a series of accidents threatened the global stability of the mine. These accidents urged the Società Veneta Montanistica to let the mine out to Antonio de Manzoni, who carried on extractions in a ruinous manner, without planned explorations, leading to the closure of the mine in 1879. There were various attempts to reopen the mine, both at the end of the 1800s and during the 20th century, up to the last period of exploration between 1958 and 1963. This exploration bore no positive result, and any hope of reopening was given a final blow in January 1962, when an accident killed three people. All rocks were formed in a primordial ocean that covered the earth. Rocks accumulated into the seabed in a pre-established, unaltlterable order. Granites and schists, the oldest rocks, were formed earlier. Then basalts and some sedimentary rocks followed; lastly, sedimentary rocks with fossils, such as limestone. Granites are always found under the limestones, and they are always older. In 1800, Predazzo's unique geology made it a mecca for geologists. Everyone wanted to study the rocks around here. Two scientific theories collided: neptunism vs. plutonism; the second prevailed. It paved the way for a modern understanding of the origin of rocks and the evolution of our planet. At Candaten (where there was an ancient hostel with annexed chapel; pictured above) you are only a few steps’ away from the Cordevole stream, and here – in the picnic area – you will find several panels along the brief circular trail that summarise the main naturalistic aspects that characterise the area (and the riverbed). The Cordevole runs for about 79 km; it is the most important stream in the Dolomites, and the main tributary of the river Piave. It crosses the entire Agordo region from Passo Pordoi (2,239 m, where its source is located) to the val Belluna south of Sedico, at an altitude of 275 m. Like all streams in the eastern Alps, it is extremely variable in flow rate, and it carries a large amount of gravel, sand and pebbles with it. The force of the stream in full flood – in spring and autumn – can erode its shores, while it runs very dry during the summer, when it has a reduced flow rate. It is for this reason that its course changes constantly within the wide riverbed, which assumes the typical meandering character. Plant life in the stream changes too, as a consequence of these extremely variable environmental conditions; therefore, this is a complex ecosystem that is extremely dynamic, in which constant (and occasionally sudden) events bring about continuous changes in the natural balance, which never achieves a definitive equilibrium. Geology. Observing the val Cordevole riverbed allows everyone to notice the extreme variety it displays: the fingers of both hands probably wouldn’t suffice to count the different sorts of rocks making up the stream’s pebbles. In fact, the stream flows throughout the entire Agordo region, carrying with it the different types of rocks that characterise the areas it crosses. You will therefore find metamorphic rocks; rocks of volcanic origin mixed in with calcareous rocks and those native to the Dolomites, in all of their variations. Stones are of all colours: the most ancient are black, iridescent schists; there are red-purplish porphyry, dark volcanic rocks, red sandstone as well as green-blue, brown and crystalline white Dolostone (Dolomite) – in a nutshell, quite a collection! And there is no lack of surprises and curiosities, either – as well as rarities such as dark fragments where irregular contours and visible bubbles appear. These pebbles are made of lava: residues of the metal fusion that are scattered throughout the stream’s gravelly bed; remains of the metallurgic activity that took place for centuries in the mines of valle Imperina (about 12 km from Candaten; read below). The Animals of the Stream. The stream and riparian plant life (trees, bushes and herbs) host many different kinds of wildlife. The woodlands along the shore offer refuge to numerous bird species, including Tawny Owl (Strix aluco – a nocturnal bird of prey that feeds on small rodents); Great Spotted Woodpecker (Dendrocopos major); Eurasian Nut-hatch (Sitta europaea), which nests in the hollows of old plants – besides many other types of perching birds (small passerines). From time to time, Grey Heron (Ardea cinerea) and Little Egret (Egretta garzetta) fly through, while other birds – such as Grey- (Motacilla cinerea) and White Wagtail (Motacilla alba), White-Throated Dipper (Cinclus cinclus) and two small wading birds, Little Ringed Plover (Charadrius dubius) and the small Common Sandpiper (Actitis hypoleucos) – are more closely linked to the stream and its habitats. Marble Trout (Salmo marmoratus), present in the waters of the Park, has been the object of specific studies, and a special re-colonisation project has begun. It is believed that Marble Trout living here is the only fish belonging to the Salmonidae family native to the rivers of the Veneto region, and its populations are included among the species risking extinction. In all of Northern Italy, the introduction of Yellow Trout (Oncorhynchus clarki) has led to a strong hybridisation between the two species, and for that reason – in accordance to European conservation regulations regarding the safeguard of Marble Trout – the Park has forbidden the introduction of Yellow Trout into its waters and is also regulating scientific selective fishing, in order to favour the re-population of Marble Trout. Plant Life. The plant communities present along the Cordevole are selected mainly by the stream’s regime – that is, by the constant alternation of periods in which it is overflowing or in low water. The landscape is made up of pioneer plant formations, as well as more stable riparian communities that not infrequently fade into the woodlands covering the mountain slopes. Gravel and sands in the riverbed are often bare or host tufts of grassy vegetation, where Calamagrostis pseudophragmites stands out: this is a tall reed, belonging to the Graminaceae family, that can be recognised in late summer by its red spikes. The gravelly bed is quickly colonised by willow bushes: Olive or Hoary Willow (Salix eleagnos) is commonly found near Purple Osier Willow (Salix purpurea). Classic riparian Grey Alder (Alnus incana) woods can be seen near the shores, where they form thickets that are often impenetrable. There are other broadleaved standing beside Alder, such as various Willow species, Black Poplar and many kinds of shrubs and herbs. In some cases, in the areas that are less prone to flooding, these formations evolve towards more mature woodlands with Scots’ Pine (Pinus sylvestris) and Norway Spruce (Picea abies), or even with European Ash (Fraxinus excelsior) and Sycamore Maple (Acer pseudoplatanus). The origins of the inn (hostel, or hospice) at Agre are documented by a series of donations, purchases and exchanges which had taken place between 1139 and 1148 between two citizens of Agordo named Predeo and Cibilina, whose goal was to accumulate the necessary property endowement to found and maintain an inn. The project called for the investment in a series of properties located in the whereabouts of Agre and Rivamonte, not far from the place where the inn and annexed chapel would be built. In 1555, the small church – dedicated originally to Saint Bartholomew – and the ‘domus hospitalis ibi existente’ (the ‘hospice already existing here’), were acknowledged as property of the Canonic chapter of the Cathedral of Belluno by a papal bull from Pope Adrian IV. The inn at Agre is the smallest of the three hospices exhisting in the Val Cordevole. It was usually presided by a local family, but it would also be supervised by the Chapter of the Cathedral of Belluno, until it was definitely turned over to the Carthusian monks of the Vedana Charterhouse in 1460. Some friezes and the monogram of the order are still visible on the columns. Particularly noteworthy are some portions of the flooring on the ground floor and in the larìn (fireplace) corner of a room, also with a characteristic barrel vault ceiling. The church was dedicated to Saint Mary Magdalene since the 14th century, and it still preserves its primitive mural (wall) structure, a large frescoed consecration crucifix, the ancient flooring and a tombstone dating back to 1760, while the original semi-circular foundations of the apse can be seen outdoors. The Ardo valley can certainly be considered among the most noteworthy features within the Dolomiti Bellunesi National Park. It is distinguished by a discreet charm, and by the atmospheric – but perhaps a bit gloomy – appearance of its canyons (being so narrow, it doesn’t receive much sunlight – especially in winter). This valley is also notable for its small rural settlements (such as Case Viel, pictured below) – remnants of an old time and mostly abandoned by now – and for the innumerable traces linked to past and recent human activities (trails, mule-tracks, cultivated Patches of land, old rural buildings, dry stone walls, terracing – and the ‘casere’, traditional dairy pens). The Ardo forms a deeply cut valley originated by the confluence of a well-developed network of smaller rivulets and impluvia that criss-cross and drain the southern side of the Monte Schiara group (2,565 m). It pushes deep into the mountain, while on the other side – often imprisoned into humid and dark canyons – it almost reaches the outskirts of the provincial capital of Belluno. The valley – very narrow in various sections – cuts in fact through the whole stratigraphic succession of Dolomite rocks, from the most ancient (Main Dolomite and Soverzene Formation) to the more recent ones (Tertiary Flysch and Molasses formations), within the sub-montane sector of the park. The frequent sections of canyons (with a narrow and constricted valley floor, confined by smooth, overhanging rock walls) testify to the important role played by the Ardo stream in shaping the morphogenesis of the valley. The diffused and noteworthy presence of glacial deposits – often embedded and affected by landslides and erosion phenomena – documents in all respects also the role played by glacial moulding, through the action exerted by a crept-in side branch of the Piave glacier during the culminating phase of the last glaciation. Along the valley it is possible to observe two different canyons that witness the deviations in the course of the Ardo: the Bus del Buson and the Pont de la Mortis. The ‘fossil’ canyon of Bus del Buson (pictured below), deeply cut into the 'Biancone' (a white flint limestone, now often referred to as maiolica), is an extremely narrow canyon, probably incised by a sub-glacial stream during the final phases of the last glaciations (when the valley was still occupied by a glacial ‘tongue’), and then abandoned by the stream when the ice sheet receded. In the area of Pont de la Mortis, the stream draws an ample bend and runs in a narrow gorge, deeply cut into the marl limestone of the 'Scaglia Rossa' (‘Red Scale’). This gorge – which is made even more atmospheric by the contrast between the red rocks and the crystal clear water – represents a relatively recent ‘gap’ that the stream was forced to open following a huge landslide (the accumulation of material is clearly visible just after the bridge to the left) which had submerged the old valley, forcing the water course to move further to the right (westwards). It is therefore a fossil gorge (technically speaking, an epigenetic gorge) – a passage that the Ardo was forced to open in relatively recent geologic times, which was then abandoned by the stream when the ice sheet drew back. This is a digression of the ‘Alta Via delle Dolomiti n. 1’ (‘Dolomites’ Highway No. 1’) that allows to admire a spectacular canyon – the so-called fossil gorge known as ‘Bus del Buson’, located at the entrance of the protected area. The trail is part of the project “Due Passi Alle Porte Del Parco” (literally, ‘Two Steps at the Park’s Gateway’) – which prompted the re-qualification of paths in several municipalities of the Parco Nazionale Dolomiti Bellunesi, involving the territory of 10 ‘comuni’ (municipalities) of the Park. 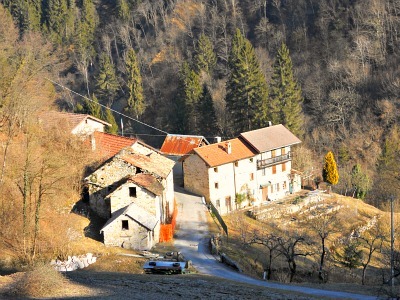 The itineraries are all situated along the foothills of the Val Belluna, and are connected to the thematic long-distance trail “Chiesette pedemontane – Santi guerrieri e Santi guaritori nelle Dolomiti Bellunesi” (‘Trail of the Abandoned Churches’, described in more detail below), which has constituted an essential reference point for the individuation of the different legs of the route of provincial and regional interest known as “Il Cammino delle Dolomiti” (‘The Dolomites’ Walk’), which covers part of the territories of the dioceses of Feltre and Belluno. These are short itineraries on existing tracks, connected in a circular fashion whenever possible, and dedicated to a wide range of users – not necessarily to experienced hikers and excursionists only. The brief loop we are dealing with here – in the setting of the Ardo valley floor – can be walked by people of all abilities (even though some care must be taken), and allows one to discover a great variety of habitats. Along the trail, eigth boards illustrate not just the naturalistic aspects, but also those connected to the history of these places and the legendary creatures that – according to popular belief – inhabit them. 1) The Bus del Busòn: a Fossil Stream. Are you familiar with shell, fish or dinosaur fossils? Most likely you are, of course! But perhaps you didn’t know that there is also such a thing as a fossil stream. There are primitive valleys, hollowed out by water that later changed its course, which have left behind them “dry rivers” – and a spectacular example is visible only at a stone’s throw from here. This is precisely the Bus del Busòn: a deep, narrow canyon carved by a stream that, during the last glaciation, most likely flowed under the ice that still occupied the valley. With the retreat of the glacier, the waters began to flow at a lower level, leaving the canyon dry. The result of these events is a spectacle of nature that never ceases to astonish and fascinate. In order to reach this point and visit the gorge, one must follow a mule track on foot for about 15 minutes, then make a sharp bend towards the right and descend along a curving path, until arriving at the entrance of the fossil gulley. Continue inside the gulley – which can be walked through for about 200 metres – until you come upon a steep wooded slope; from there, begin to climb along a narrow path that leads back to the locality of Case Bortot. This circular itinerary is a hike that requires about 1 h and ½. The trail presents no particular dangers, as long as one does not leave the main track: so, do not head off the path, because there are cliffs and overhangs. The bottom of the gulley – even if it is not dangerous – can be very humid and slippery; therefore, it definitely should not be approached in rainy weather. Some informative panels placed along the trail illustrate this spectacular geo-morphological phenomenon, as well as the area’s characteristic flora and fauna. You will also witness the most astonishing (and perhaps unexpected) evidence of the presence of man in these places – since the remotest of times. In more recent years, the Bus del Busòn is no longer only a destination for interesting excursions: thanks to its very singular acoustics and ideal conformation, it has also become an “Auditorium of Stone”, where actors and musicians can perform live surrounded by nature at its grandest. 2) A mosaic of woodlands. The landscape of the Dolomiti Bellunesi National Park – from the viewpoint of vegetation – is really varied. Often, to steep, sun-drenched slopes are alternated deep canyons (or gorges), and to the contrasts in the shapes of the geological landscape correspond quite diverse aspects of the plant life. This short hiking loop is no exception: in the first part of the descent to the Bus del Busòn one crosses a thermophile patch of woodland (that is, characteristic of warm and sunny slopes), in which there is an abundance of Hop Hornbeam (Ostrya carpinifolia) and Manna (or Flowering) Ash (Fraxinus ornus). This type of woodland occupies vast surfaces in the outer portion of the park – especially in its southern section, and is often managed as copse, regularly coppiced by the resident population, who organised it in ‘civic uses’ for the production of small timber and firewood. Here in the Ardo valley there is also the presence of woodland sub-types dominated by Common Hornbeam (Carpinus betulus), which can be seen at an altitude of up to 1,000 metres, along with – more rarely – an association with Linden (or Lime) (Tilia ssp.). The micro-climate becomes cooler during the descent to the Bus del Busòn as it unwinds, making it possible for hikers to admire strips of woodland of particular naturalistic and environmental interest, which host species such as Maple (Acer pseudoplatanus), Lime (Tilia ssp.) and even Yew (Taxus baccata) – a precious representative of the habitats found in the more profound hollows and gorges. 3) The ‘Prince of the Night’. The mid-altitude woodlands of the southern Alps – such as those in this location – are home to the prince of the night: the Tawny Owl (Strix aluco). Anywhere above an altitude of 1,000 metres, this bird of prey tends to be progressively replaced by Tengmalm's Owl (Aegolius funereus). It is easy to tell the Tawny Owl apart from other owls because it has no tufts around its ears and the iris is dark, giving it a severe, spooky look. But equally, since this is a species with a typically nocturnal behaviour, it is more easily heard than seen. Its call is very audible and easily recognised, while its flight is the most silent of any bird. The Boreal (or Tengmalm's) Owl’s plumage, instead, is covered by a light fuzz, which allows it to slice through the air without producing the slightest rustle. This is the extraordinary adaptation that the nocturnal birds of prey use to surprise their prey (mostly mice, squirrel, dormice and small birds). The Tawny Owl is the most widespread species of nocturnal birds of prey in the province (there are 100-130 couples estimated in the territory of the Park alone) and, like all nocturnal birds of prey, it is a sedentary species, which presides over its territory all year round… just like a true prince! 4) The Archaeological site at the Col del Busòn. Not far from here, in 1988 the Friends of Belluno Museum discovered an important archaeological (Prehistoric) site, which has been frequented repeatedly for the past 5,400 years. Excavation campaigns were supervised by the Archaeological Superintendency for the Veneto region (Sovrintendenza Archeologica del Veneto), and have made it possible for thousands of finds to come to light: handmade products in flint, fragments of terracotta pottery, animal bones, food residue, copper objects and jewellery, fragments from fireplaces and terracing, and remains of wall structures. The discovery of some handmade goods in obsidian (volcanic glass) – a rare material, whose origins are quite remote and far from this area – reveals the remarkable geographic distances covered for the circulation and exchange of certain precious materials during the Prehistoric era. A copper axe dating back to the third millennium B.C. – found here – is practically identical to the one discovered near the Similaun man in South Tyrol. The position of the site at the Col del Busòn – perched high on a hilltop that is inaccessible from three sides, and protected by a wall structure – would suggest the presence of a fortified village, and is most likely connected to the function of controlling the routes that led to high-altitude pastures. 5) Two Plants from the Gulley. The cool, damp micro-climate of the Bus del Busòn favours a very particular kind of vegetation. The walls have been smoothed out by millennia of slow, gradual flow of water, making it the ideal environment for a luxuriant array of mosses and ferns to thrive. Amongst other plants, stand out specimens of Yew (Taxus baccata): this tree, typical of canyon/gorge environments, is an evergreen plant easily found around gullies, and it has a trunk that branches off at the base, with flat needles resembling a comb. Since this is a poisonous species, it is also known as the “Tree of Death”. Yet, yew wood is incredibly pliable and resistant, and it has been used since prehistoric times to build bows: proof that this weapon was indeed made out of yew wood is already attested in prehistoric times. The bow used by the Similaun man was also made of yew. The characteristic that makes it so suited to building bows is its resistance, both in compression and traction, as well as its incredible elasticity. In the area there is also an abundance of ferns – in particular Hart’s Tongue fern (Asplenium scolopendrium), which is a guide species in the woods around gullies: habitats that are considered of primary importance by European standards. The shiny green leaves of this fern are whole, with undulated edges that make them resemble – precisely – a tongue. This fern thrives in cool, shaded places near bodies of water, springs, pools and caves – with a clear preference for areas where the soil is chalky (calcareous); they can be found in all temperate-cold areas or climates of Europe, Asia and North America. Its medicinal uses were already known at the time of the Greek botanist Dioscorides, who wrote: “when the leaves are dipped in wine, they can be used as an antidote to (or a remedy against) snakebites, or to help blood circulation and treat dysentery”. Mattioli, a physician from Siena (1501-1578), wrote a book called «Discourses by Pier Andrea Mattioli about the work of Dioscorides», where he suggested using this fern for ‘all passions of the heart’. In all honesty, however, today this herb is used only as a modest astringent, diuretic and expectorant, as well as an initial remedy for burns. 6) The Bus del Busòn. This is a true cut, carved into the stone. It is also known as Bus del Busòn de la S’cesora (‘of the incision’), as it twists along – in a winding manner – for about 250 metres, among rock walls that practically brush up one against the other. The rock layers are formed by a kind of limestone called ‘Biancone’ (or maiolica), which takes us back to about 100 million years ago – to the Cretaceous period, when this area was covered by a deep ocean, and carbonated mud (from which the ‘Biancone’ precisely took origin) was deposited, giving the layers (and the rock) their name (‘Biancone’=white). The presence of knots (nodules) and strips of flint in this formation is due to the presence of marine organisms with a siliceous shell (radiolarian, sponge spicules) that were originally scattered inside the sediment. The ‘Biancone’ has the characteristic trait of displaying a conchoidal fracture (undulated as in glass), and a very fine grain. But how did the Bus del Busòn come into being? This extremely narrow gulley was probably carved by a sub-glacial stream during the final phases of the last Ice Age (or glaciation – circa 15,000 years ago), when the valley was still occupied by a strip of ice (technically, a glacial tongue). At a later stage, following a landslide, the stream left the gorge, and carved its way through a new course running parallel to the original one. Today the waters of the Ardo stream flow 150 metres below, and what is left is a suspended fossil gorge – a geo-morphological relic of unique, unquestionable wonder. 7) Dino Buzzati, the ‘Writer of the Dolomites’. “I leave my house, walk across the front yard and turn around. 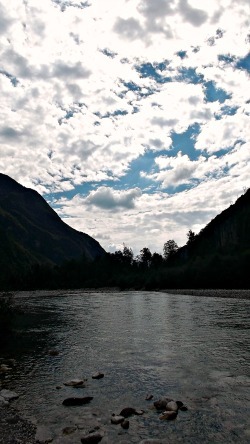 Every summer, when I return to our country home here – about a stone’s throw from Belluno – in the morning I go out, walk across the front yard, and when I have reached the other end, I turn around. That is when I see the Schiara. (…) I sit on a step of the small stone staircase, and as the sun slowly turns I look upon the mountain of my lifetime, but she does not look back at me; she is locked in her impenetrable thoughts. Shadows shrink and swell along the very steep concave cliffs of her plunging depths, to remind me of the strange enchantments of my lost youth” (Dino Buzzati, 1964). The Masiere di Vedana are an arid, desolate and stony area, bleak and bare, colonized with difficulty by a sparse vegetation. The tormented landscape of the Masiere di Vedana forms an atmospheric and enigmatic microcosm situated at the margins of the Dolomiti Bellunesi National Park, near the Certosa di Vedàna (Vedana Charterhouse, described below and also in a dedicated page). Many things have been written on the origin of the Masiere, and there are numerous legends around them (as it often happens with mysterious natural events). The formation of this imposing debris deposit (known as ‘macereto’ in Italian – from the word ‘maceria’, ruin), scattered with big boulders, is to be connected with a series of huge landslides, which detached from Monte Peron at the end of the last glaciations (around 15,000 years ago), when in the Mas-Peron streams’ basin stationed the edge of the Cordevole ice sheet – by then almost completely disjointed from the main Piave glacier. The Masiere can therefore be considered a proper accumulation of so-called ‘marocche glaciali’ – that is, a massive heap of landslide material, confusedly scattered by the ice sheet as it was retreating. In the vicinity, lost in this arid environment, there is also an unusual wetland area – and that is the small moraine-originated Lago di Vedana (Vedana Lake), lying in a small depression along an abandoned relic branch of the Cordevole. Anyway, this tormented landscape was colonized by fragments of vegetation – a scrub with an often dwarf-prostrate habit of growth – and thickets of a pioneer xerophile vegetation (that is, warmth/aridity-loving species); as a tendency, these plants are horophile too (which means that they are typical of more elevated vegetation bands, usually montane-Alpine). There is also a noteworthy contingent of species of Illyrian (Eastern) provenance, often found here at their easternmost limit of distribution – which adds to the floral richness of the area. The “copper valley”: the Valle Imperina is particularly noteworthy as a former minerary district; it is a side valley of the Cordevole, and it is structured along an evident discontinuity fault-line (the Valsugana overthrust), which puts into contact the more ancient rocks of the metamorphic crystalline basement with the stratified layers of Main Dolomite (above, a picture of the abandoned mining site of Valle Imperina, which has now been turned into one of the Dolomiti Bellunesi National Park Visitor centres). In the transversal profile of the valley an obvious asymmetry is evident (it is therefore an ‘asymmetric valley’), determined by the diverse lithology of the two different sides: the right bank – which is steeper and at times craggy – is sculpted in compact, tenacious Main Dolomite formations, while the left bank – a lot less steep – is modeled in the soft, degradable rocks of the Metamorphic Basement (Phyllites). The Imperina valley, though, is especially famous for its copper mines, which remained active – albeit with different fortunes – for more than 5 centuries (from 1400 to 1962). In this minerary district there was a sulphur vein, cultivated for a long time (giving especially pyrite copper and iron sulphur). Through a complex metallurgic procedure (blending, bleaching, and repeated fusions), a good quality workable copper was obtained at the end of this process – a material mostly appreciated for its high resistance to alterations (hence Venice used it for the making of cannons, ship covers, and to forge coins too). At the end of the 1800s, after extensive copper mines were discovered in South America, the world price of copper fell, and production in the Imperina valley suffered as a result. In the 20th century the mines were reconverted, with the use of pyrite for the production of sulphuric acid, and later exploited by the chemical industry to produce fertilizers – but eventually production ceased altogether in 1962. 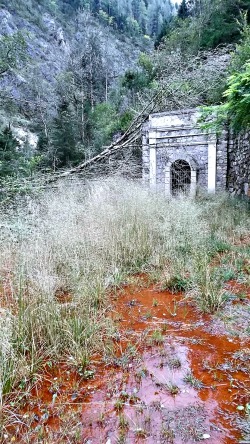 All in all, the anthropic (human) aspect of the Imperina valley is strictly connected to its minerary past, but the natural outlook of the area has been heavily affected by this, with evident signs of degradation in places (see, in the image below, the typical colour of the copper oxides, tainting the water). The first certain historical records indicate that mining in the Valle Imperina dates back to the first few years of the 15th century, thanks to a concession funded by the Republic of Venice for the mining of copper. Most likely, the extraction of materials from this site had already started in Pre-Roman times, considering the particular conditions, the position of the mineral ore and the proximity with the ‘Canale d’Agordo’; this theory is also backed up by the large amount of items made from bronze and copper found in archaeological excavations carried out throughout the province of Belluno. A notable increase in the production of copper derived from the passage of the mines’ rights of property from private hands to those of the Republic of Venice; in fact, initially, the mining activity was subdivided in tunnels and ‘mints’ owned (and run) by private individuals with obvious management problems, and with consequent lack of efficiency of the mine itself. This passage came about in a gradual manner starting at the end of the 1600, but it was only in 1835 that the mines formally became public property, in the hands of the Austro-Hungarian Empire. The extraction of copper continued in this area, with ups and downs, up until the end of the 1800s, when the company Magni & Co. of Vicenza initially rented and subsequently bought the mines – and therefore the rights to all the minerals, represented essentially by copper-poor pyrite, which was then taken directly to other factories for the production of sulphuric acid. During the first few years of the last century, the whole process was electrified, and in 1925 a new standard-gauge electric railway line from Bribano to Agordo became operational; the stop at La Valle allowed for the loading on carriage of the materials which had been extracted from the mine, taken to the station by cable-ways. After WW1, the production became stable at around 50,000 tonnes a year up to the period 1940-44. Following this phase, after a first attempt to modernise the mine in the early 1950s, the conditions of the mineral deposit and its exhaustion initially led to staff reductions and, finally, to the complete closure of the mining site, on September 8th, 1962. The val Cordevole has preserved its age-old charm on this trail: its crisp beauty, atmosphere and the evidence of an old history are just waiting to be retold. In the Middle Ages, the valleys of the Dolomites were travelled by many wayfarers from the heart of the Empire, heading to (or returning from) Rome through the Alps. The Val Cordevole was the most direct connection, and it also guaranteed transportation for the metals extracted from the mines of the Agordino towards the market towns and cities of the Po valley plains. There was no lack of danger, however: precipices, cave-ins, floods, ambushes set by bandits and other impervious passages dictated by the nature of the Alps made this transit particularly treacherous. Venetian chronicler Marin Sanudo reported his first-hand experience way back in the late 1400s; having forded the Cordevole after the village of Peròn, he continued “through the mountains on horseback” to Castello Agordino, where the road became so narrow and steep that “one could no longer proceed on horseback: one must get down”. This is why a network of inns came into being in the Dolomiti Bellunesi, between the Monti del Sole and the Monte Schiara, as early as the second half of the 12th century. These facilities were dedicated to offering aid and hospitality, open day and night to all those in need, regardless of origin, social status or religion. The itinerary in question alternates between easy stretches on dirt or paved roads (which present no technical difficulties to the hiker) and paths halfway up the mountain that are a bit more challenging but characterised by gentle inclines for the most part. Several exposed passages located in the central portion of the trail demand special attention and should be avoided during the winter due to the presence of ice. It takes a full day of walking to complete the ‘via degli Ospizi’; however, it is advisable to take one’s time on this trail, breaking it up into two or three segments (we suggest Vedana-Candaten/Candaten-Agre/Agre-Le Miniere/Valle Imperina): we believe that the only way to fully grasp and enjoy the environmental rarities, the many traces of the passage of mankind and the historical events animating these places over the centuries is by taking them in slowly. The itinerary we propose here connects several little churches at the foothill of the Dolomiti Bellunesi. It is a unique, original route combining Nature, history, art and culture across these valleys – today very little known – that once used to be frequented passes where travellers could find some rest and solace in peaceful places of worship. The trail starts from the Croce d’Aune pass (about 1,000 metres, situated between the municipalities of Pedavena and Sovramonte at the foot of the Vette Feltrine), and runs all the way to Polpet (in the municipality of Ponte nelle Alpi); overall, the route covers a distance of about 110 km. It is articulated in 13 stages (or legs) of reasonable difficulty, extending all along the foothill belt bordering the southern fringe of the Dolomiti Bellunesi National Park, passing through different landscapes from pleasant valley floors characterised by fields, lawns and groups of fine rural houses to sunny, impervious mountainsides, where copse woods alternate with glades and clearings of extraordinary floral value. Finally, from some sections along the way, you can easily reach into the fresher climate of the numerous side valleys crossed by the tributary mountain streams of the Piave, and – during hot summer days – enjoy agreeable cool climate there. The route is appropriately marked by direction arrows, and is being shown on illustrated panels located near each church, which also give out interesting historic information on the individual buildings (here only sketched very briefly). 1) Santuario dei Santi Tiburzio e Susanna in Monte (Sanctuary of Saints Tiburtius and Susanna-by-the-Mountain) in Sovramonte. First documented in the 16th century, but it may have been erected upon a pre-existing building. The faithful would go in pilgrimage to this little church to pray for a cure for whooping coughs or for intercession to conceive a child. 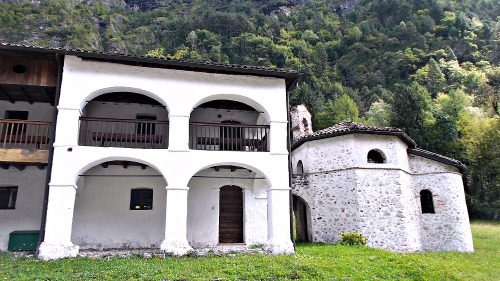 2) Santuario di San Martino in Valle (Sanctuary of Saint-Martin-in-the-Valley) in Valle San Martino. First documented in 1584, but built upon a pre-existing church dating back to the Early Middle Ages, this saint was invoked by man-of-arms, wayfarers, innkeepers and wine makers. 3) Santuario di San Mauro in Monte (Sanctuary of Saint Maurus-by-the-Mountain) in Arson (Feltre). Probably founded in the 16th century, this saint was invoked especially to favour rainfall. 4) Chiesa di Sant'Eurosia e San Giovanni Battista (Church of Saint Eurosia and St. John the Baptist) at Le Ave (Cesiomaggiore). First documented in the 16th century; the intercession of these two saints was invoked to protect the harvests. 5) Santuario di Sant'Agapito in Valle (Sanctuary of Saint Agapitus-in-the-Valley), also in Cesiomaggiore. First documented in 1533, but probably founded during the Middle Ages. The fields were blessed during the procession to this church, as the faithful implored that there would be protection against summer storms that year. 6) Santuario di San Mauro in Valscura (Sanctuary of Saint Maurus in Val Scura), Santa Giustina. First documented in 1530; the intercession of this saint was also requested to cure toothaches. 7) Santuario di San Felice in Monte (Sanctuary of Saint-Felix-by-the-Mountain), San Gregorio nelle Alpi. First documented in the 15th century, but built upon a pre-existing church dating to the 12th century, this saint was invoked for his intercession regarding agricultural work. 8) Santuario di San Michele Arcangelo ai Campi (Sanctuary of Saint Michael Archangel-in-the-Fields) at Pascoli (Sospirolo). First documented in 1598, this was the patron saint of swordsmen, and it was often invoked by soldiers and men-of-arms to propitiate a ‘good death’. 9) Santuario di Santa Guiliana (Sanctuary of Saint Juliana) at Regolanuova (Sospirolo). Built in the 15th century upon the ruins of the Misso castle; the intercessions of this saint were requested to cure stomach aches. 10) Santuario di San Giorgio (Sanctuary of Saint George). First documented in 1434 but probably pre-existing, this saint was invoked for intercession to favour rainfall and to make children who didn’t like cheese eat it! 11) Santuario di San Michele Arcangelo (Sanctuary of Saint Michael the Archangel) at Colfiorito. First documented in 1514; among its activities, are to be remembered the rogations to propitiate Divine protection for the fields and during harvest. 12) Santuario di San Liberale (Sanctuary of Saint Liberale) at Pedeserva (Belluno). Founded in the early Middle Ages; this saint was invoked for protection against epidemics and drought. 13) Santuario di Sant'Andrea in Monte (Sanctuary of Saint Andrew-by-the-Mountain) in Ponte nelle Alpi. Founded in the 14th century, it has since undergone expansion over time. Saint Andrew was invoked against female infertility and to propitiate fair weather. 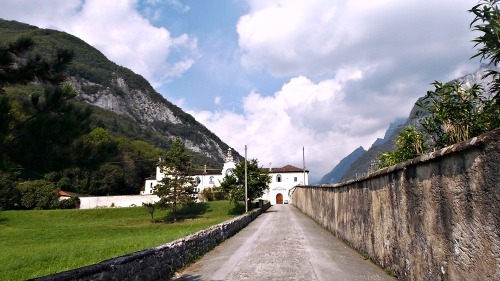 The atmospheric building of the Certosa di Vedana, or Vedana Charterhouse (pictured above), is surrounded by stones and steep mountainsides that recall the harshness of the absolute and radical choice made by women and men who devoted their entire existence to God. Carthusian monks and nuns sought communication with the Divine through the silence of Nature and delivered a message of peace and serenity to the wayfarer – not only to those passing through the valley known as ‘Canale d’Agordo’ but to all travellers on this planet. The arrival of the Carthusian order in the Val Cordevole dates back to the mid-15th century, when the canonic chapter of the Cathedral in Belluno offered them the inns and hospices at Vedana, Candaten and Agre (all described earlier on this page). These facilities had already been standing for about three centuries by then, but had fallen into decline; the priests wanted to recuperate them in order to continue to guarantee hospitality to wayfarers according to the ancient traditions. It was the year 1456 when the Carthusian monks decided to build a monastery about 500 metres from the San Marco hospice (located by the nearby hamlet of San Gottardo). The new church was completed after approximately fifteen years, while the cloisters were finished in 1521, and the cells (originally six) had become eight by 1542. 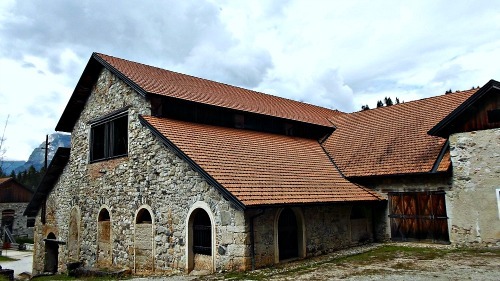 The monastery would be renovated during the 17th century, while the property’s heritage developed along with it. In time, it would incorporate 4,500 hectares of woodland, meadows, fields and pastures. Managing this property would bring the community into contact with merchants, mining authorities and the Republic of Venice. However, the Charterhouse’s history would be halted abruptly: in 1768, the monastery was shut by decree of the ‘Serenissima’ (the ‘Most Serene Republic of Venice’); everything would then be auctioned off, and the property dismembered. The Order purchased the monastery again in 1882; it was then restructured, and the Carthusian monks returned to Vedana after an absence of over a century. The Charterhouse – the monument of greatest historical-architectural value within the territory of the park – has been meticulously restored in 1994-98; the Dolomiti Bellunesi National Park has made a significant contribution to this initiative. The building is simple and stern, but it holds rooms that have been assembled and furnished with mastery, based upon the habitual lifestyle of the monks. Today a small community of Carthusian cloistered nuns lives there; therefore, this means that unfortunately the monastery cannot normally be visited (but look out for some special occasions!). “Near us exist valleys that I have never seen anywhere else (…) the Mis valley, for instance, with its little side valleys that penetrate in an intricate network these wild mountains without glory … ”. This is just another quote from the renowned local writer Dino Buzzati, who deeply loved his mountains and often wrote about them(Please note that there is a dedicated page on the Valle del Mis; nevertheless, given its proximity with the Val Cordevole, I have put some information here also). The Mis valley is certainly one of the noteworthy features of the park, and it is distinguished by its natural peculiarities and the somber, enigmatic fascination of its craggy and wild environments, with the presence of karstic canyons and gorges. The quality of its biotopes (especially wetlands – lake, waterfalls, karstic springs, pot-holes) is further enriched by the discreet presence of small niches of old rural settlements – such as Gena Alta and Gena Media, Pattine, La Stua – and the numerous traces of past and recent human activities, often bearing the traits of abandonment (trails, mule-tracks, cultivated patches, old rural buildings, dry stone walls, terraces and ‘casere’: the old traditional dairy pens). 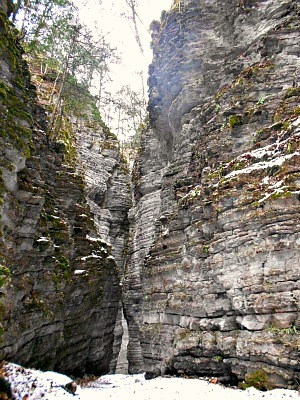 The Mis valley is an important transversal corridor within the park, in the shape of a narrow and deep canyon confined among high, smooth and shifty rock walls. It is a very ancient glacial valley that crosses transversally the entire chain of the Dolomiti Bellunesi National Park, thus allowing one to observe all its main geologic formations, from the 'Scaglia Rossa' at the valley entrance to the Main Dolomite at its core. The Valle del Mis – as it often happens with ancient valleys – is a complex environmental system, to whose evolution contributed several factors: glaciers, water courses, slopes’ degradation processes (landslides and erosion) and, locally, karstic corrosion too. The glacial moulding – mainly due to the action of the ancient Mis glacier during the glacial eras – is recognizable by the vaguely ‘U-shaped’ valley’s transversal profile, denoted by a relatively ample valley floor and steep side slopes. Particularly atmospheric is the segment of valley between Gena Bassa and Titele (known as ‘Canale del Mis’) that takes the aspect of a deeply incised gorge in the stratified rock banks of Main Dolomite, to whose formation have contributed significantly the karstic corrosion processes (so to form a classic karstic canyon). This canyon is flanked by a system of deep and narrow side valleys and gorges, some of which are clearly structured along important fault-lines (Val Falcina, Val Brenton, Val Soffia, Val Rui Bianch, Val Lunga). f) the Val Falcina – a deep fluvial cut along which has been devised an interesting circular nature trail (see also the Valle del Mis page for this). In the high Mis valley, in an area known as Vallalta – not far from the boundary with Trentino – there were once also important mercury mines, active from 1700 to 1963, traces of which can still be detected today. Even though the district now looks abandoned and mostly overgrown in thick vegetation, it still retains a peculiar charm.